Objectives To explore views of all stakeholders (patients, optometrists, general practitioners (GPs), commissioners and ophthalmologists) regarding the operation of community-based enhanced optometric services. Design Qualitative study using mixed methods (patient satisfaction surveys, semi-structured telephone interviews and optometrist focus groups). Setting A minor eye conditions scheme (MECS) and glaucoma referral refinement scheme (GRRS) provided by accredited community optometrists. Participants 189 patients, 25 community optometrists, 4 glaucoma specialist hospital optometrists (GRRS), 5 ophthalmologists, 6 GPs (MECS), 4 commissioners. Results Overall, 99% (GRRS) and 100% (MECS) patients were satisfied with their optometrists’ examination. The vast majority rated the following as ‘very good’; examination duration, optometrists’ listening skills, explanations of tests and management, patient involvement in decision-making, treating the patient with care and concern. 99% of MECS patients would recommend the service. Manchester optometrists were enthusiastic about GRRS, feeling fortunate to practise in a ‘pro-optometry’ area. No major negatives were reported, although both schemes were limited to patients resident within certain postcode areas, and some inappropriate GP referrals occurred (MECS). Communication with hospitals was praised in GRRS but was variable, depending on hospital (MECS). Training for both schemes was valuable and appropriate but should be ongoing. MECS GPs were very supportive, reporting the scheme would reduce secondary care referral numbers, although some MECS patients were referred back to GPs for medication. Ophthalmologists (MECS and GRRS) expressed very positive views and widely acknowledged that these new care pathways would reduce unnecessary referrals and shorten patient waiting times. Commissioners felt both schemes met or exceeded expectations in terms of quality of care, allowing patients to be seen quicker and more efficiently. Conclusions Locally commissioned schemes can be a positive experience for all involved. With appropriate training, clear referral pathways and good communication, community optometrists can offer high-quality services that are highly acceptable to patients, health professionals and commissioners. This is the first study to describe the views and attitudes of all key stakeholders (patients, optometrists, general practitioners, ophthalmologists and commissioners) on the operation of community-based enhanced optometric services. The wide range of qualitative methods used comprised patient satisfaction questionnaires validated by follow-up telephone interviews, focus groups and semi-structured telephone interviews. The need for more cost-effective NHS services is increasingly impacting health policy and service delivery. Ophthalmologists are overstretched and resource-heavy to train, and therefore, alternative models of care are being explored. In 2005, the Department of Health commissioned a review of the General Ophthalmic Services (GOS)1 which focused on how to support and develop a wider range of community-based eye care services and recommended a three-tiered GOS framework comprising: (a) essential services: provision of the standard sight test, (b) additional services: that is, domiciliary sight tests and (c) enhanced services, such as community referral refinement and management of acute eye conditions. Across England, enhanced service schemes (ESS) (now known as Community Eyecare Services) within primary care are delivered by optometrists, outside the GOS contract. While schemes are dependent on purpose, the intended outcomes are to help community optometrists and dispensing opticians work collaboratively with local commissioners and/or hospital eye services (HES) to design and add value to local eye health pathways. Aims of ESS include making services accessible for patients who would otherwise have to be managed in hospital, and increasing the cost-effectiveness of services. ESS are locally commissioned and heavily dependent on existing infrastructure. Establishing effective monitoring strategies for chronic conditions requires the input of service providers and service users. Care plans that place burdens on patients may result in reduced willingness to attend, leading to compromised quality of care.2 ,3 The health professionals' and patients' views regarding aspects of their condition are not always aligned,4 ,5 and views of all stakeholders must be considered when commissioning services. 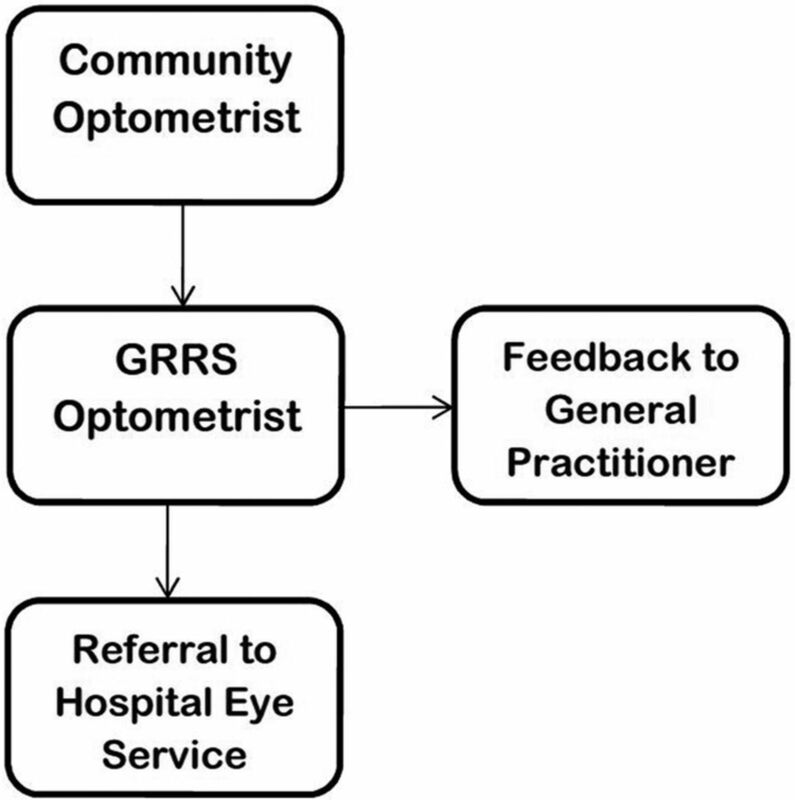 This paper reports on a qualitative study to determine views and attitudes of stakeholders, including patients, regarding two representative ESS: a minor eye conditions scheme (MECS) in South London and a glaucoma referral refinement scheme (GRRS) in Manchester. This study complements our previous qualitative research which investigated the development and implementation of these schemes.6 The current study aims to establish if the schemes met stakeholders' expectations. Under the MECS, patients presenting to their general practitioner (GP) with an eye problem and satisfying certain inclusion criteria are referred to specially trained community optometrists. The scheme also allows patients to access MECS optometrists directly. Patients were examined by optometrists within 48 hours and could be either managed within community optometric practice or referred directly to the HES. Patients could also be referred to their GP for systemic investigations (see figure 1). Minor eye conditions scheme patient pathway. In the GRRS, patients with suspected glaucoma or ocular hypertension following a standard GOS sight test are referred to accredited community optometrists. These accredited optometrists work to an agreed set of referral criteria and, depending on whether or not patients meet these criteria, either refer the patients to the HES or discharge them (see figure 2). Glaucoma referral refinement scheme patient pathway. Four target groups of stakeholders participated, using mixed methods of data collection to maximise response rates and data quality (table 1). The sampling strategy was designed to be inclusive and capture views of healthcare professionals, commissioners and patients. As some groups, for example, ophthalmologists/commissioners, had small numbers, all participants in these groups were included in the sample frame. A questionnaire, adapted from an Ipsos MORI validated GP survey,7 was developed. It comprised questions with multiple choice answers and respondents graded their satisfaction with the scheme. There was one open-ended question for recommendations and an option for respondents to leave their telephone number if they were willing to participate in a further indepth discussion. The questionnaire was almost identical for both schemes, with minor scheme-specific amendments only (copies in online supplementary file). After their appointment, patients were given a questionnaire to complete and return in a prepaid envelope. Data were collected over a 2-month period for MECS and a 6-month period for GRRS because the number of patients seen per week was fewer than in MECS. Two meetings took place; in November 2014 in London (MECS optometrists) and June 2015 in Manchester (GRRS optometrists). All optometrists in the schemes were invited to participate. Topic guides were devised outlining broad question areas, and their contents were informed by our previous study.6 The guide topics acted only as suggestions; the precise wording of questions used at meetings did not adhere rigidly to the guide scripts, although each topic was addressed in a similar way, nor was the order of the topics fixed (see online supplementary file ‘topic guide’). Prompts were used to introduce topic areas and encourage respondents to elaborate, but the onus was on participants to supply the overall discussion content. Questions were open and ‘non-leading’, although more specific questioning was used, when required, to clarify points made by participants. A purposive sample of GPs from MECS was contacted, including high, medium and low scheme users. Ophthalmologists from MECS and GRRS and OLGA optometrists from GRRS were invited to participate. All questionnaires were completed during a telephone interview and data entered at the point of administration. Commissioners of MECS and GRRS were contacted and a short semistructured questionnaire was administered by telephone, using the same format as the questionnaire to health professionals, with an emphasis on meeting expectations, cost-effectiveness and continuation of the scheme. Focus groups were audio recorded (with permission from the participants). The dialogue from the recordings was later transcribed and reviewed by the investigators. Data from interviews and focus groups were analysed using framework analysis8 as displayed in table 2. The qualitative software package NVIVO v.10.2 (QSR International, Cambridge, Massachusetts, USA) was used to organise the thematic framework by refining and condensing the categories that had been manually identified and to identify additional themes for further analysis. All qualitative data were indexed according to themes and questions central to the main research questions. During analysis, sub-themes that emerged were explored and indexed accordingly. Direct quotes from transcripts and interviews were chosen to illustrate key emerging themes. The questionnaire consisted of eight (GRRS) or nine (MECS) multiple choice questions and one open-ended question. There were 109 responses for MECS (∼28% response rate) and 80 (∼21% response rate) for GRRS. Overall satisfaction results (figure 3) revealed that the vast majority of patients reported satisfaction with their appointment and any subsequent treatment. Ninety-five per cent of participants in both schemes had confidence and trust in their optometrist. The responses to more specific questions about the optometrist's performance are presented in table 3. The vast majority of patients rated as ‘very good’ the time allowed for the examination, the optometrist listening to the patient's concerns, explanations of tests and management, involving the patient in decision-making, and treating the patient with care and concern. MECS allows for self-referral; therefore, these patients were asked if they would recommend the service to family and friends, and 99% of patients would. In both schemes, there was one open-ended question asking how the scheme could be improved. Nineteen per cent of GRRS and 16% of MECS patients responded. The majority of patients in both schemes merely reiterated how happy they were with their visit and treatment, and 4% of MECS patients wanted the scheme to be better publicised. Neither group saw major negatives to being involved in their scheme, although in GRRS there was an issue regarding interaction with ophthalmologists at outlying hospitals. Both schemes were limited to patients resident within certain postcode areas and this was reported to be a negative feature. Many of these difficulties were attributed to poor administration and knowledge of the scheme among hospital staff and ophthalmologists not directly connected to the scheme. In GRRS, it was recognised that the excellent training was given in 2013; therefore, additional formal training, perhaps annually, would be useful. The form and content of the training was discussed. Optic disc assessment was an area where all could benefit from continued training, preferably viewing stereoscopic disc images rather than monoscopic images. In a similar fashion, MECS optometrists valued peer review and saw this as a way to continue training. GRRS optometrists' main recommendation was for a mechanism for ensuring urgent cases were seen urgently without optometrists having to telephone to follow-up their referral. An electronic pathway with the hospital was the preferred method, allowing information to be passed in both directions, permitting optometrists to see confirmation of appointments, and providing reassurance that the referral had followed the correct route. MECS optometrists recommended GP training and possibly some inpractice training for GP reception staff. Optometrists wished to receive ophthalmologist feedback as standard, rather than the current range between ophthalmologists who provide regular feedback and those who offer none. With MECS, better advertising of the scheme was requested. This suggestion was regarded as the clinical commissioning group's responsibility and it was mentioned that advertising may have been held back previously to prevent overcapacity. Better publicity of the scheme through pharmacies was recommended, and the ability of the scheme to cope with the prospect of GPs opening 7 days a week with extended hours was raised. The cost of ongoing training was raised by one GRRS ophthalmologist. Training takes place in ophthalmologists and optometrists own time, without remuneration, with a further cost implication for optometrists who have to take unpaid time out of their practice. It was felt that commissioners should recognise this issue and provide support. Having secure, electronic communication would benefit GRRS, and a fully electronic patient record could improve triage and communication, enabling hospitals to provide optometrists with images and information for ongoing monitoring. One MECS ophthalmologist was concerned that if the scheme expanded, then standards could fall. The main finding is that both schemes were received positively by all involved and, despite a few minor issues and concerns, the schemes were classed as a success by commissioners, patients and providers. Patients made no negative comments on either scheme, and saw great benefit in receiving care locally. The high quality of care provided was a theme running through all stakeholder reports. Patients, ophthalmologists and commissioners were all impressed by the standard of care, supporting the view that community optometrists are an acceptable alternative to hospital care for certain services and can provide a streamlined pathway to secondary care by eliminating unnecessary referrals. It was acknowledged by community optometrists and HES that training was vital in producing and maintaining a high standard of care. It was widely agreed that some form of ongoing training in both schemes was required. In the current schemes, both hospital ophthalmologists and optometrists maintained an open-to-contact policy; however, in reality, community optometrists, although they knew this to be the case, felt awkward approaching and accessing the help on offer. A more structured and planned method of training could benefit all involved. How training is planned and funded would need discussion. There was an undercurrent that commissioners should recognise this requirement and provide funding for it. This study highlights the importance of the HES being fully committed to enhanced optometric services and demonstrates the value of good interprofessional communication. 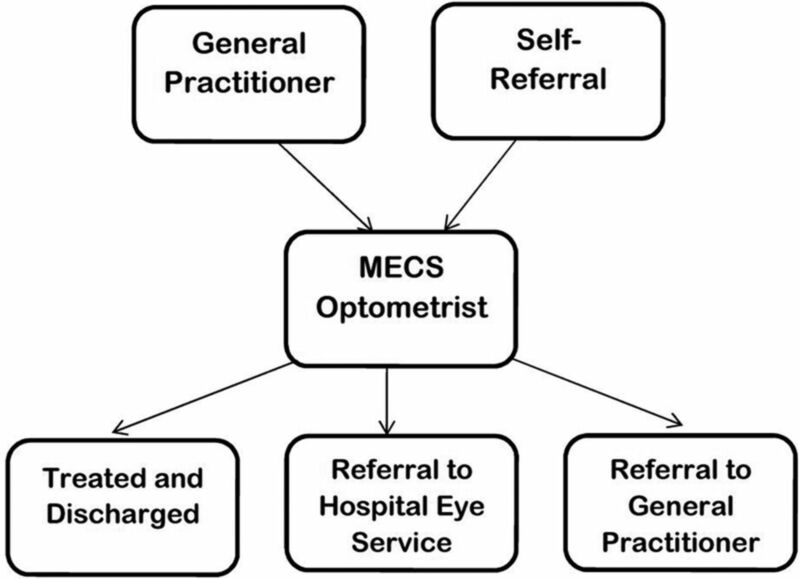 In MECS, one hospital provided a more streamlined referral pathway, which led to optometrists opting to refer more urgent cases to this hospital. It is likely that referral pathways could be improved through an electronic referral system, but this would ideally require community optometrists to be connected to the N3 network, which provides secure broadband connectivity across the NHS. The role of ESS is to streamline services, be cost-effective and reduce the burden on secondary care. Most GPs interviewed in MECS highlighted that very few patients attending the GP practice get directed to an optometrist without first being reviewed by the GP, because referral of these patients by reception staff conferred too much clinical responsibility. Some patients who required particular eye-drops were referred back from the MECS optometrist to the GP for prescribing, resulting in a three visit consultation, which is neither cost-effective nor streamlined. Although MECS optometrists were able to supply a number of ophthalmic medications that are appropriate for treating common eye conditions, for example, ocular lubricants, topical antibiotics and antiallergy drugs, none of the participating optometrists had specialist prescribing qualifications.16 Consequently, some patients were referred back to the GP for them to prescribe certain medications that the optometrist was unable to supply or where it was likely that the patient needed repeat prescribing for a chronic condition, for example, preservative-free lubricants for dry eye. In future, this problem could potentially be addressed via the use of Patient Group Directions (PGDs), which provide a legal framework that allows particular healthcare professionals (including optometrists) to supply and/or administer a specified medicine(s) to a predefined group of patients, without them having to see a doctor. The local nature of both schemes raises issues of equity of care. GRRS could be expanded, through recruitment of more optometrists and practices to cover a wider area. However, wide expansion would not be possible with MECS as bordering areas, such as Croydon, have their own schemes and cross-funding is an issue. Commissioners are aware that optometrists favour a scheme across South London, but some commissioners appear reluctant to fund this enlarged scheme. Government changes and healthcare priorities put ESS under pressure to perform and continually prove their effectiveness. If either scheme were to be expanded, careful consideration would need to be taken to ensure quality of care is maintained. Structured training, and clear patient pathways would need to be put in place. The major strength of this study is the multi-stakeholder perspective. The mixed methods approach to capturing these views offered each group a convenient and congenial opportunity to voice their opinions. There was an excellent response rate for participants heavily invested in the scheme (optometrists, HES and commissioners). There are some study limitations. All participation was voluntary and though every attempt was made to maximise the number of participants, some groups are represented more than others. GPs in MECS were particularly difficult to recruit and those recruited could have been the ones with more positive views of the scheme. Data saturation is often used as a quality indicator in qualitative research. Resource limitations and participant availability meant that we were only able to conduct two optometrist focus groups. To ensure that the views and experiences of the majority of scheme participants were captured, these groups were larger than is optimal and it is possible that further themes may have emerged by using multiple smaller groups. However, the optometrist focus groups were characterised by a high level of participant engagement and consensus was reached. We are therefore confident that we have reliably identified the views of participating community optometrists regarding both schemes. This multi-stakeholder study identified that locally commissioned ESS can be a positive experience for all involved. With appropriate training, clear referral pathways and good communication, community optometrists can offer high-quality services that are highly acceptable to patients, health professionals and commissioners. The authors would like to thank all participants for giving up their time to participate in the study. The authors would also like to thank members of the Enhanced Scheme Evaluation Project Steering Group for their valuable comments. Department of Health. General Ophthalmic Services Review. Findings in relation to the framework for primary ophthalmic services, the position of dispensing opticians in relation to the NHS, Local Optical Committees, and the administration of General Ophthalmic Services payments. Gateway reference: 7689. 2007. http://webarchive.nationalarchives.gov.uk/+/dh.gov.uk/en/publicationsandstatistics/publications/publicationspolicyandguidance/dh_063984 (accessed 17 Oct 2016).
. Qualitative data analysis for applied policy research. In: Bryman A, Burgess RG. eds. Analysing qualitative data. London: Routledge, 1994. The NHS quality, innovation, productivity and prevention challenge: an introduction for clinicians, Department of Health gateway reference: 13551. 2010. http://webarchive.nationalarchives.gov.uk/+/www.dh.gov.uk/en/Publicationsandstatistics/Publications/PublicationsPolicyAndGuidance/DH_113806 (accessed 17 Oct 2016). Contributors The analysis and interpretation of the data was initially undertaken by HB and checked by JGL, RAH and DFE. The article was drafted by HB and revised by JGL, RAH and DFE. All authors contributed to the design of the study and approved the final version of the article. HB is the guarantor. Funding This work was supported by a research grant from the College of Optometrists. Competing interests HB's time on this study was funded by the College of Optometrists. Ethics approval School of Health Sciences Research and Ethics Committee, City, University of London.